Teaching your dog to wait is a very powerful command that you should definitely teach your German Shepherd. Teaching your GSD to be patient and to wait for you until you give him the release command is really important - especially if you plan to work him all the way up to off leash handling or in the upper ends of obedience work training. This is one of several dog training safety type commands that you can use to help monitor your German Shepherd and keep him safe from any kind of potential dangers at all times. This command could even be lifesaving in the right situations - that is just how important this command really is. "Wait" is the perfect word to use to tell your German Shepherd that he can have what he wants, but just not right this second - he has to be patient and wait first. Dogs live in the present. Keep this in mind whenever training your German Shepherd - at any time. Teaching your dog to wait - more importantly, how to patiently "Wait", is a new concept to your GSD that can be very difficult for them to understand at first. In the wild, dogs don't have to wait but your dog can learn and understand the meaning of the word "Wait" with time and with lots of practice and practice. The most effective training tool you have whenever training your German Shepherd to "Wait" is simply the tone of your voice. Your voice during training is one of the most effective tools that you can use in any aspect of dog training. Your GSD always looks to you for approval and direction and your German Shepherd needs to be able to understand your vocal tone to properly respond to it. Keep in mind that your dog is a pack animal and that you are his pack leader. Let's delve a little deeper into it. 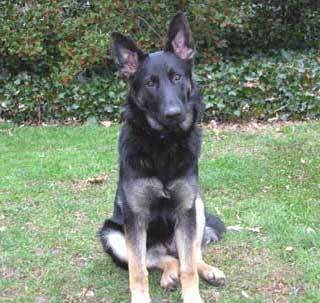 Whenever your German Shepherd is doing anything at all, try saying anything in a moderately disapproving tone. I imagine your dog will probably stop whatever it is doing pretty fast. Try this for example, if you want your dog to wait for you at the door before going outside, say "Wait" in a serious but not an angry tone, just before he gets there - your dog will probably pause... waiting to see what you want next. If he continues on without pausing, say "NO, WAIT!" in a firmer tone. Basically, the command "Wait" means for your dog to momentarily pause. In the above example, teaching your dog to wait at the door gives your GSD the joy of anticipation - waiting on what's coming next. It lets your German Shepherd puppy know that if he pauses just for a few moments, that he can soon continue outside to the next adventure with your full and complete approval. One of the best uses for the command "Wait" is when you are putting your dogs food down. Make him wait for a few seconds as you put the bowl down and get out of the way before he gets to eat his dinner. Next, give him a release command such as: "Break!" or "Free!" It is also helpful to teach your German Shepherd to wait for you as you go first through doorways or down flights of stairs. Remember, just as important as the wait command is the release. "Wait" must always be followed by the release command to let your dog know it is all right for him to continue on with any future activities. Teaching your dog to wait is a very powerful command and comes in handy in many instances. It can be very helpful to teach your dog "wait" to get out of the car or to go out the front door or in a host of other circumstances. Good luck in your training your dog how to wait - I'm sure you'll wonder how you got by without it before.